Peace & Tranquility - Yours to Own. NOT OPEN TO THE PUBLIC. A members only park on the bank of the Colo River. For information on how to become a member refer to the link above. Welcome to Colo River Holiday Park. On the picturesque shores of the Colo River lies a slightly undulating river plain of significant beauty. Surrounded by rocky mountain outcrops and dotted with native bushland families can enjoy for a day, week or month. Colo River Holiday Park was founded in 1981. It is a owner-member holiday destination privately owned by the members for the enjoyment of them and their guests, with permanent on-site managers. Accommodation is in van/park units, fully equipped for up to 4/6 persons. The park is set in 15 acres on the shores of the beautiful Colo River surrounded by the Wollemi National and Parr State Recreational Parks. Arrivals Arrival times are strictly between office hours. 9am - 1pm and 2pm - 6pm daily and up to 9pm Friday's during peak times. In non peak times the park managers days off are Tuesday and Wednesday. Arrivals on these days must be by prior arrangement with park managers. The managers bell is not to be used outside these times (except for emergency). Please park at the front gate and ring the mangers bell located on the fence outside the entrance to the office. Please be patient as the managers could be anywhere within the park grounds and may take a few minutes to get to the door. Tell the manager the members name you are staying with as well as your last name so your cabin can be assigned to you. The manager will give you a set of keys giving you access to the main gate as well as to your cabin. All other facilities within the park do not require keys. Cars can be taken to the van for unloading and loading only. At all other times the vehicles are to be parked in the designated parking areas. Your van is to be checked by the managers prior to departure. Check outs will be done only during office hours. Please clean and mop your van (mops, hot water and floor detergent are located in the laundry). Amenities - are closed for 45mins each day for cleaning. Toilets are located in the adult van for use during this period. To comply with health regulations, showers must be mopped after each use (mop and disinfectant are located in each amenity block). Mobile phone There is no mobile reception available for mobile phones within the park. A pay phone is located in the adults van in the park and a pay phone is located at the Singleton end of the park outside the fence. Shops - The nearest shop is located approx 15 mins at Wilberforce. There is however a service station a little closer. Drinking Water - The water for the park is pumped from the Colo River and put through a filtration system. Although it is approved for dirinking it is recommended that fresh drinking water be brought in as after rain the water can appear a little dirty. The Colo river is a well kept secret mainly known by locals and regular visitors. The Colo river is special because it is a pristine and wild river on the border of Sydney, only 1.5 hours (65 klms) from the centre of Sydney. The name "Colo" is derived from the aboriginal word for Koala. 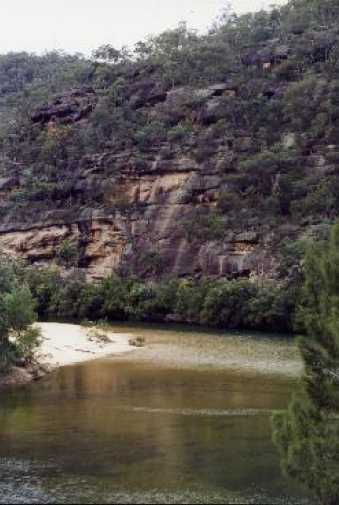 The Colo river was one of the first rivers explored after white settlement of Australia and has a long history that is of significance to the local aborigines and the white settlers alike. It is the home of bass and platypus. 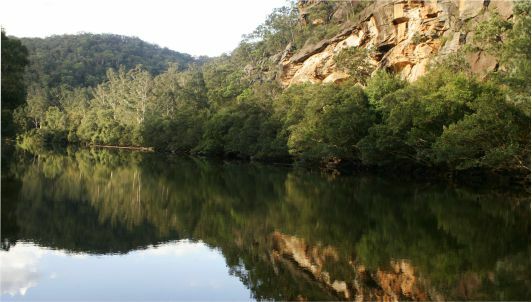 It is a great venue for canoeing, bushwalking and swimming. The upper reaches of the Colo river seldom sees visitors other than the occasional hardy bushwalker.